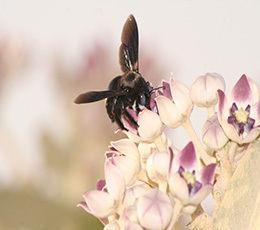 The present contribution is a first brief attempt to give an overview of flower visiting by aculeate wasps and bees in the Dubai Desert Conservation Reserve (DDCR), and as far as has been established the first of its kind for the United Arab Emirates. Seventeen sites within the reserve were well sampled and, in order to see the reserve in relation to its position in the peninsula, two one day transects were undertaken, one of brief sampling at six sites east from the reserve to the coast at Khor Kalba and the other of brief sampling at five sites west from the reserve to the coast in the marine reserve of the Emirates Marine Environmental Group (EMEC). Flower visitors were observed and sampled on 21 species of plants within the DDCR and on two additional species east of the DDCR and two west of the DDCR. Fifty-one species of aculeate wasps and 27 species of bees were recorded. Of the wasps, 34 species were from the DDCR and the ad¬ditional 15 from transects east and west of the Reserve. Of the bees, 23 species were from the DDCR and the additional two from transects east and west of the Reserve. Flower sampling yielded flower visiting records for 39 species of aculeate wasps and 23 species of bees. Although this preliminary survey of flower visiting by wasps and bees in the DDCR was conducted over a limited period of time, during a dry spring, following seven dry years, it has provided sufficient data to draw some general conclusions: most of the plants attract visits from a complex of both wasps and bees; the flowers of some plants attract a wide range of wasps and bees but there were no flowers that were attractive to all available wasps and bees at any one site; very few species of the wasps and bees encountered were specialists; and the plants on which these specialist wasps and bees were dependent were not themselves dependent on these species for pollination.